Hello and Happy Saturday! It's another Compendium of Curiosities Challenge. And this one is sure to amaze if you've never tried it before. The Compendium of Curiosities III Challenge is hosted by our lovely hostess Linda Ledbetter on her blog. Each challenge comes from the wonderful book "A Compendium of Curiosities Vol. III" featuring amazing products and techniques by non-other than Tim Holtz. Okay, back to the challenge. It's called Faux Cracked Glass and can be found on page 54 in the book. 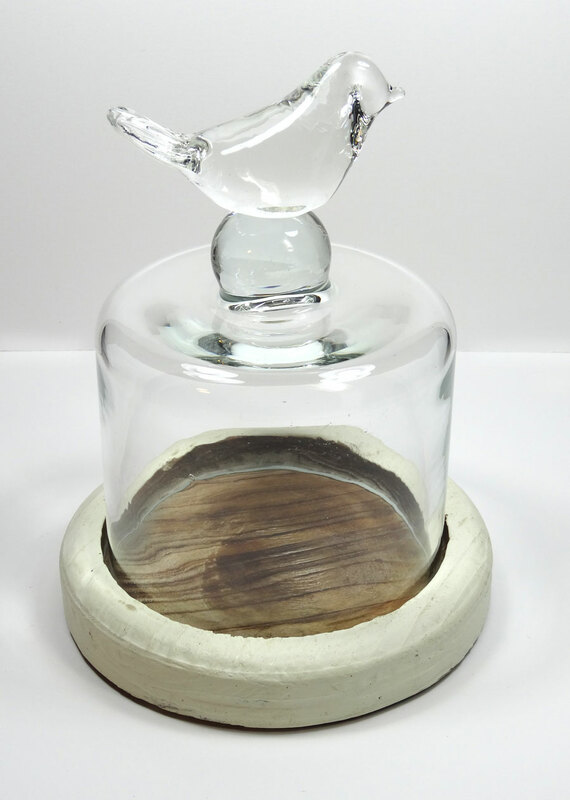 I was strolling the clearance aisle of Hobby Lobby last week, looking for an interesting glass piece I could use for the challenge and came across this little cutie marked down to $8 from $25 and snatched it up. It's about 6 inches high. A lady shopping the same aisle said she bought one last week and put a cupcake inside and gave it to a friend for her birthday. What a sweet idea. So that sealed the deal and off to the check-out I went. I painted the wooden base with two coats of Fossilized Amber Distress Paint, then performed the Faux Cracked Glass technique on the glass portion. I used Cloudy Blue, Butterscotch and Mushroom alcohol inks to colorize. I grabbed some Kraft core cardstock and my Sizzix Tiny Tattered Florals dies and started cutting various flowers. Boy, some of these are really tiny when assembled and very cute! 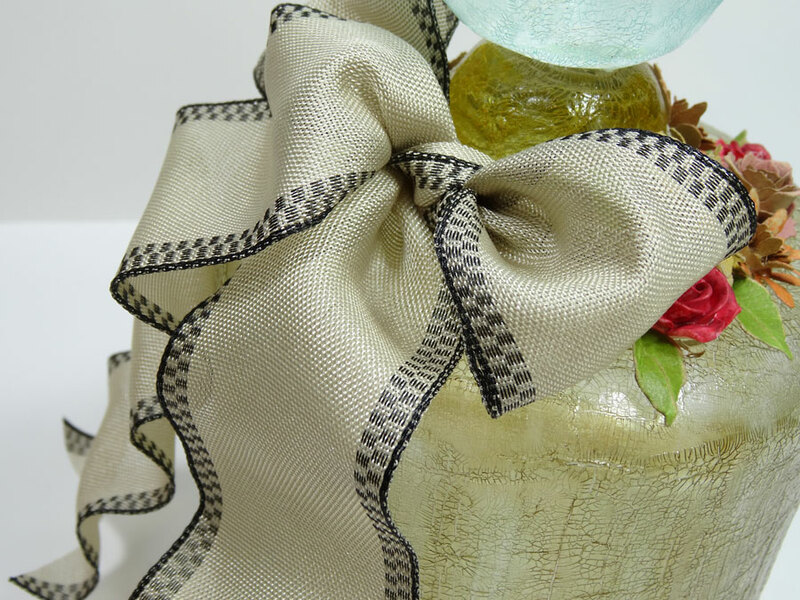 After assembling all the flowers, I tied a piece of this beautiful May Arts ribbon around the top of the glass dome and tied it into a fluffy bow. It's wired which is nice for shaping. I adhered my flowers to my glass dome using hot glue. See the darker red ones? 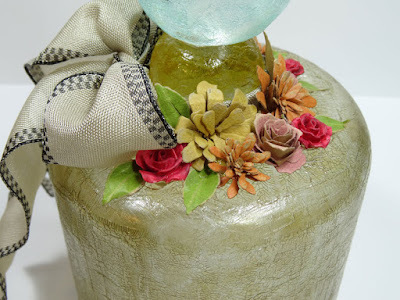 Those are Tim Holtz's new Heirloom Roses I painted with a combination of Distress Paints. They are tiny white resin flowers that can be colored with paints or alcohol inks. This is the first time I've used them. The little bird crackled so nicely, didn't she? She's colored with Cloudy Blue and I touched her beak and parts of her tail feathers with a bit of the Butterscotch. I distressed the painted base with some Vintage Photo Distress Paint and added the black grosgrain ribbon around it to tie in with the black check edging on the top ribbon. I'm not sure if a cupcake will go inside the dome topper, but I sure like the idea of putting some kind of sweet gift in there for someone special. 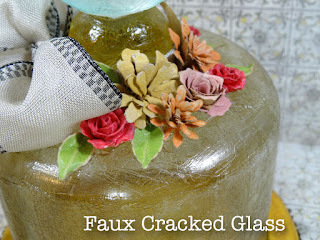 This project was so simple and fun and the Faux Cracked Glass technique is so impressive, you've just got to try it. Join us, won't you? Here are all the details below. This is beautiful, Annette! I think a cupcake for a friend would be perfect inside. Annette , this is absolutely darling! You are so talented. I adore this little glass jar! Now I HAVE to go to our Hobby Lovby to see if we have any in our clearance aisle! Haha. Love the faux cracked glass technique on this. Love the colors you used to tint the glass and those tiny tattered florals are precious here. Beautiful and inspiring piece! I think you are sending quite a few people to the clearance section at Hobby Lobby! This is adorable. I can so see it with a beautiful little cupcake inside. Love the soft colors of your faux cracked glass. Umm...wow...LOVE...don't think that is strong enough of a word...wink. THIS IS AWESOME!!!! 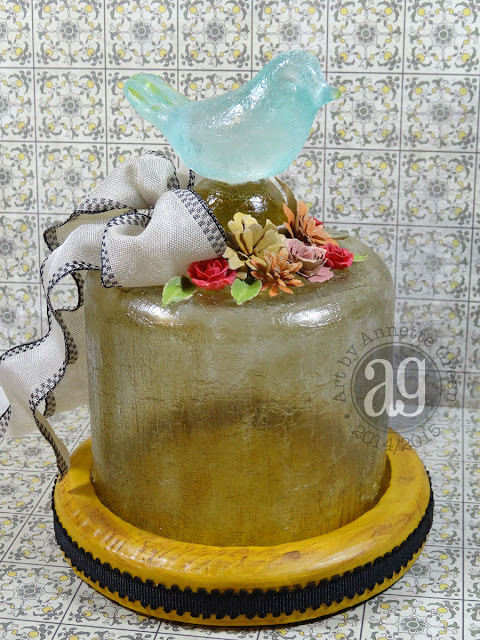 what a beautiful transformation from clear to crackled - AND tinted on this sweet glass cover - love the bird on top and your beautiful florals! How sweet!! You know I'm a sucker for birds and I do love the idea of using this as packaging for a gift. The faux cracked glass technique looks great!! Just beautiful. LOVE LOVE LOVE!!!! This rocks Annette! Such a beautiful design Annette and your crackles are amazing. 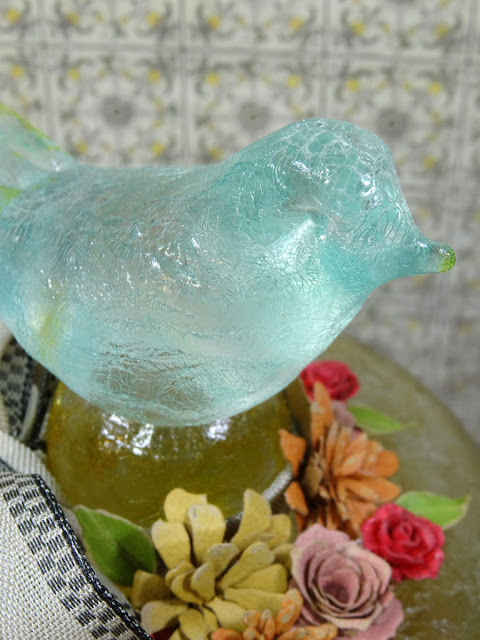 My fav part is how the little bird crackled so nicely and now you have made it the "bluebird of happiness"! Such an adorable little project Annette. j. One of the best projects I have seen! What a beautiful gift especially with a yummy cupcake!! What a beautiful transformation, Annette! You have such an eye for imagining what found objects could look like when they are all dolled up! I love the different colors on the bird and the dome and the flowers are stunning around the top! Love it! This little birdie-topped dome really WOWed me!!! What a LOVELY surprise this would make for a nursing home resident!!! And here I was just thinking on only using the tiny vials. You just kicked my mind right outta the molded park it was in & now I am seeing all the POSSIBILITIES!!! Not only that, but usinf the resin roses up against the new tiny dies was SMART; it allowed us to see what a fininashed mixture of them looks like as sometimes it's hard to visualize putting together two or more of the newer items. That clinched it for me- now I DO want the tiny flowers die. I thought I wouldn't use it as much as the ready-made resins, but I'm seeing how it could actually end up paying for itself when it comes to gift-making. That's usually my main requirement- can I copy it for less, or how much will it get used for the cost?? The Tag& Bookplates Die was probably one of the BEST things I ever purchased. I think I may have worn mine out (IF that's even POSSIBLE)...LOL!!! ChiefHubby never minds when it means I can make a personalized gift that ends up being loved - esp when so many ppl 'have everything' nowadays! Well this is gorgeous, Annette! Love the different touches of color and sweet flowers. Anyone would love to receive this, no matter what you put inside. So pretty and crackley delicious! I love the iced birdie on top! What a cute idea. I'm going to make one now out if a glass cupcake dome I recently found at taipan trading! Your projects are so creative and I love them! What a great transformation! Love this project, the technique is perfect here! This is indeed a WOW! And if a cupcake doesn't fit, a truffle would! Oh my. You totally changed the original piece. Beautiful job. Love the way you colored each section differently. Oh, what a beautiful transformation from clear to a faux cracked glass! Wonderful piece! Another adorably beautiful creation Annette! As always! That is a sweet idea! Stunning transformation and wonderful gift idea! Love the added little floral decorations. Happy Weekend! Oh no fair, we don't have Hobby Lobby in the UK. Love this little gem, someone will be a very lucky recipient. So Cute! This is so beautiful! I love your soft color combos. How inspiring! I love your tiny flowers, the perfect bow, and of course you Faux Cracked glass! Love the bird on top! You do such beautiful work! I saw a dome similar to this in a shop the other day...now to remember where I was and go get one...I love how your technique worked and the colours you used. It really makes it look special. This is fantastic! It turned out so Vintage-looking! How tiny are the flowers? I'm not nimble enough to have patience to work too tiny items, but they sure look great on the dome! Wow! what a transformation! From plain jane to superstar project! Beautiful transformation and technique faux cracked succeeded very well on any subject. Just fabulous! A wonderful gift idea, love the sweet flowers! Oh Annette this is so adorable... love the May Arts ribbon you used and the black trim at the base they ROCK ! 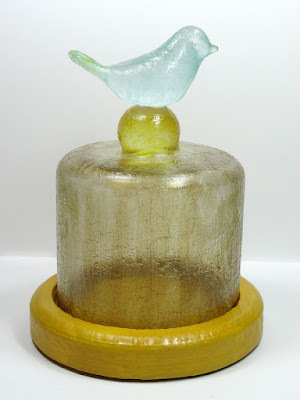 Your cracked glass on the dome and the bird are amazing ... colors are fabulous ! This is so beautiful and special. I am picturing it as table decor for a wedding with tiny lights and a bouquet inside. I have not yet been to the Hobby Lobby that opened in our city a few months ago and now I think I NEED to go! Thank you so much for this wonderful inspiration. You amaze me with what you come up with. Love this glass piece with the bird. Annette, your faux cracked glass piece is awesome, and will make the gift recipient feel very special. I love the soft blue of the bird...it shows off the technique so beautifully. I think my first comment disappeared... Anyway, what a lovely transformation! The blue bird on top is so sweet! 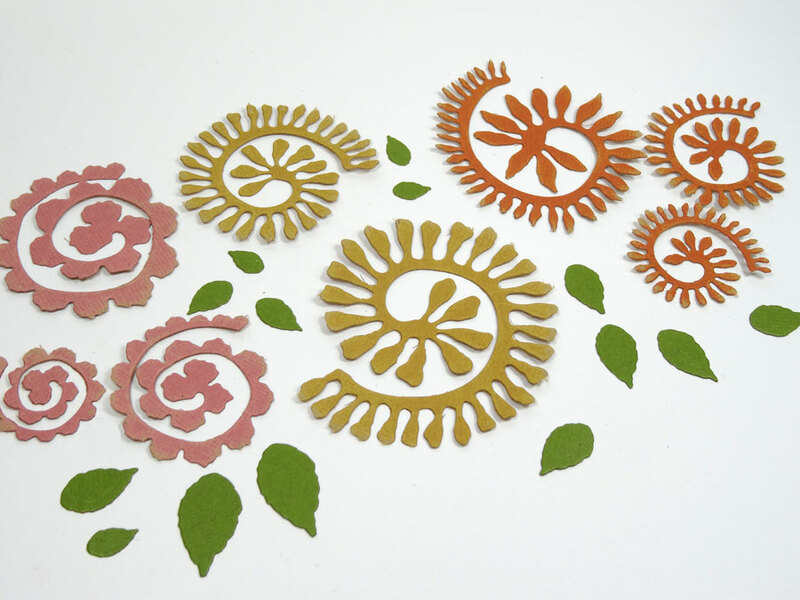 Spellbinders/Graphic 45 Blog Hop Coming!